Having already watched every TED talk released till date, 1100+, I keep scouting for other interesting ones. One good source is TEDx talks, which are independently organized TED events. Franklin Templeton Investments partnered the TEDxGateway Mumbai in December 2012, and have released a bunch of talks on FT Idea Caravan website. I went through each one of them, and this post is a brief summary of each talk. I've added my personal opinion at the end of the post. Mittal, a journalist by profession, started Vicharta Samuday Samarthan Manch in 2010. She has been working for the issues concerning the 100 million-strong Nomadic tribes of India. There's been plenty written about her on blogs and news sites. She and her organization is striving tirelessly to give identities, basic amenities and government recognition to the people of nomadic tribes. Evan is a filmmaker and an activist working on different social issues, including Gendercide. He gives wide ranging statistics on the kind of gender imbalance created as a result and it's consequences. Estimates put 200million females cumulative being lost to gendercide till now. Even today about 5mn female children are lost in India, and more than 1mn in China each year. KEY Point - Save the girl child. Change the mindset of society in India and China. It's a Girl. His story of making sanitary pads accessible and affordable to the women of India and around the world is legendary and widely covered. So I am just adding a link to an article which describes it best. Needless to add, he's an exceptional person doing amazing work. He takes a dig at over-educated crowd to use T&E method to get results. Fail fast to succeed. KEY Point - Making Sanitary Pads available for the masses. Make Measurable Social Impact. One in seven people carry water more than 1km per year, which leads to health issues. 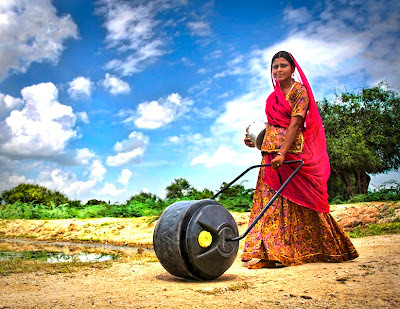 Women have to collect about 20litres per person per day, but is able to do roughly 5litres per person per day. And this water is not necessarily potable. 80% of global disease burden is because of water borne diseases, and washing hands is a decision hanging on the availability. A lot of girls drop out of school because of time taken. She then goes on to present 'Water Wheel' which aims to solve multiple problems related to water collection. Angad is an 18 year old hacker. He looks for patterns in noise and question them. Just a 4 minutes talk. He touches upon coaching as an industry being fundamentally wrong. Exams should be about creating and improving intelligence. He decided to hack the examination system. From that work, he created Examify, which tracks trends in exam questions and helps students to focus on only important questions. KEY Point - Look for patterns, improve education. Supiro Das, an Electrical Engineer, left his career after 20 years to turn into an inventor. His creation Zimba Water system is an automated chlorine dispenser, designed to take care of usual practical problems faced in water cleaning systems. His design is currently being tested in slums in Bangladesh in collaboration with Stanford University, USA. KEY Point - Prevent water borne diseases by deploying a safe water cleansing system which uses Chlorine. Vikram Patel wants 'Health for all, by all'. He touches upon how to shift healthcare from specialists to general people trained to provide the same. This, in his opinion will help intervene the medical problems of millions of people suffering today. This video is not working currently, you may see his TED Global Talk instead. $300 House - Christian Sarkar, while working in Haiti ended up being part of a team to design a house for $300 (or a very-very low cost house). This Guardian article interviews Mr. Sarkar on it's various aspects. He goes to tell about different projects submitted for achieving this goal. M&M won the contest and are now planning to build a village based on their design in Bihar in areas rehabilitated after the floods. Ruma touches upon the world of deaf people. 6% of Indian population, approximately 67 million people in India. She worked to create a curriculum to teach in Sign language. She shares story of Karan, a deaf person from a village made it to Noida for learning Computers. He is currently productively employed in MPhasis Pune. She now has several of her students employed across the industry. KEY Point - Big changes can happen with small thoughts, accept diversity and understand deaf people. 17 years old Shree Bose is the first grand prize winner of Google's Science Fair. She has also spoken at TEDxWomen and received $50,000 from Google as prize money. She put forths her views on how to preserve the curiosity and creativity of a child, follow your passions and dreams. She is currently a fresher at Harvard. KEY point - Move from "Dumb him down" to "Break the Mould"
She started Pratham network which pushes for improving reading skills in Indian children. 300 million children are starved for good books to feed their imagination. Pratham transformed into a books organization with a big vision to put books in the hands of every child. They have also put around 300 books under creative commons, to have wider readership. She asks the audience to contribute by giving books to children. A color blind person's quest to perceive color via sound. Each color has a frequency. After perceiving color via this method, he did a project to find dominant color of a city. He is able to compose music from faces. And in eight years of doing this, he is also able to do the reverse, i.e. see colors when listening to music. This led to a clothing line. He also started Cyborg Foundation which explores different projects integrating technology with us. Matt's project of pritable electronics, went from idea to prototypes to product. They ended up making a non-toxic conducting paint. They want to make components which act as a platform to enable others to make interesting projects. Myshkin, works for Biosense, where they have developed a needle free Anemia screening machine. A PhD holding Engineer, former McKinsey consultant is a passionate entrepreneur. He puts forth his story of how this product ToucHb came to be. The device is based on Photoplethysmography, and it was also announced at TED 2012. The device is now available for pre-order in India. Standing ovation. Bravo! Joao presents the energy issues faced by mankind, and presents a passive-energy solution for charging different devices. He shows his AIR-E Concept which uses Piezoelectric properties for converting vibrations from breathing into electricity. KEY Point - Cultivate, share and grow ideas to solve big problems, like energy. Karthik is the founder of social networking site Socialblood.org. KEY Point - Social Blood, Blood donation which is location aware and social. He starts with the concepts which India gave to the world, in particular Vedic Maths. He mentions that India ranks 73rd out of 74 countries (above Krygyzstan) in maths, science and reading (according to PISA). He has developed courses for Vedic maths. KEY Point - Shows aspects of Vedic Maths and how it may help the world afraid of Math. The speakers above are exceptional people, doing important work. Meaningful work, to make a difference. These ideas are meant to spark the same spirit in each one of us to do the work of our lifetimes. p.s. I signed up for Social Blood. I'd recommend you join too!